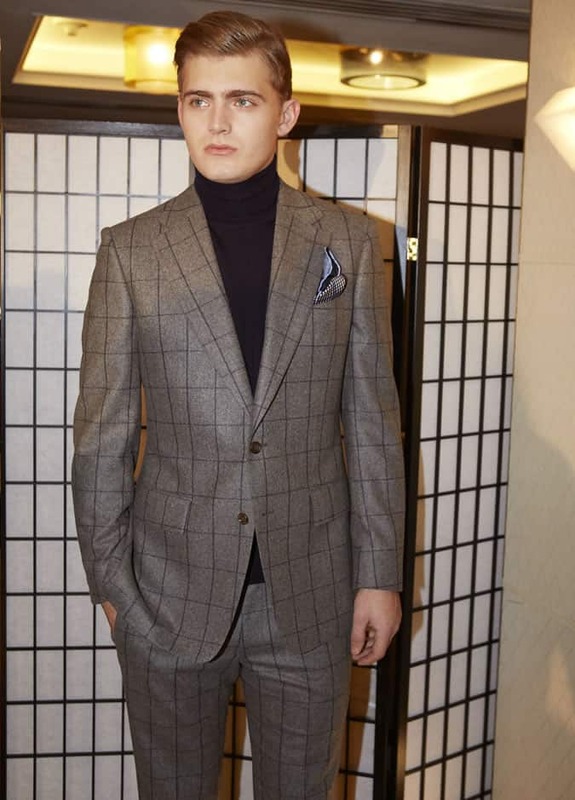 Savile Row resident Chester Barrie presented its latest collection as part of London Collections: MEN’s autumn/winter 2014 showcase. London’s celebrity haunt ‘The Club at the Ivy’ played host to proceedings. The brand picked a playful casino theme to show off the line to its attendees, which included male model David Gandy and Olympic gymnast Louis Smith. Key pieces included a horizontally striped charcoal Ebury suit in two ply English worsted wool, a cashmere-cotton-silk blended Drury shawl collared smoking jacket, and five-pocket western-style trousers. Established in 1935 by Simon Ackerman, the brand displayed signs of a new direction in the form of an outwear collection. The offering contained a navy/black houndstooth pea coat in pure merino wool, a double-breasted reefer coat, a Richmond golfing jacket and a quilted body-warmer with water resistant finish by luxury Italian label Loro Piana. Prices for these pieces have been confirmed to start at £275, going up to £845. Creative director and buyer for Chester Barrie, Christopher Modoo, was keen to outline the brand’s “Nod towards producing more staple items injected into its tailoring line”. The brand was also featured as part of the Savile Row Collections/Woolmark event held at the Cabinet War Rooms. For more information, visit the Chester Barrie website or pop into the label’s Mayfair location.